We’ve compiled a general review of Allegiant Air that gives you a decent look at the airline from the consumer’s perspective. Where does Allegiant fly? Does Allegiant charge for baggage? Will I get snacks on Allegiant during my flight? Does Allegiant have Wi-Fi? All your questions will be answered here. Read on for an in-depth outline of basic company info, ticketing/fare options, extra fees charged for things like baggage, seat specs, inflight amenities, consumer satisfaction (including performance variables), and more. Tag Line: Travel is our deal. Main Hub: Allegiant has a number of “focus hubs” rather than 1 main hub, and they are headquartered in Las Vegas, NV. Focus hubs are: Bellingham, Cincinnati, Fort Lauderdale, Fort Walton Beach, Las Vegas, Los Angeles, New Orleans, Oakland, Orlando/Sanford, Phoenix-Mesa, Pittsburgh, Punta Gorda, and St.Petersberg/Clearwater. Allegiant Air interactive route map showing flights from Las Vegas, NV. Image courtesy of allegiantair.com. There are a few important notes about Allegiant Air to review before discussing ticketing options. Destinations: When it comes to destinations, Allegiant prefers to use a combination of large airports in top U.S. vacation areas (like Las Vegas, Orlando, and Phoenix), and smaller secondary airports where airport fees cost less (like Belleville, IL; Laredo, TX; and Stockton, CA). Service Days: Allegiant does not operate flights every day from every location. Allegiant says the days each specific route is available are based on the most popular ones people generally fly. They claim operating fewer flights with more passengers allows them to cut costs and pass savings along to the consumer. Additionally, the number of days per week Allegiant flies certain routes depends on the popularity of the route. For example, Las Vegas to/from Fresno operates an average of 6 days per week, while Las Vegas to/from Austin operates 3-4 days per week. Las Vegas to/from Bismark operates just 2 days per week. Example fares from Las Vegas on Allegiant Air. Image courtesy of allegiantair.com. Base Fare: Allegiant Air is classified as an “Ultra-Low Cost Airline.” This means base fares are advertised at an extremely low price, but you should absolutely expect to pay additional fees for add-ons and extras. Your base fare includes a standard seat from point A to point B and 1 personal item (like a purse, backpack or laptop bag). That’s it. Remember, these add-ons and extras are often baggage allowances and amenities that customers are used to receiving with basic fares on more traditional airlines. You can find the most common added fees listed below in our Baggage & Other Fees section. Allegiant Air does not offer business or first class ticketing options at this time. That being said, some flights do offer “Giant Seats” and Legroom+ seating options for an additional fee (see below). All itineraries can be canceled for a full refund up to 24 hours after the booking has been made, unless you’ve booked within 1 week of your departure. Otherwise, tickets are non-refundable. For cancellations made more than 24 hours after booking, you will be issued an Allegiant Credit Voucher for future travel (less cancellation fees). This voucher must be used within 12 months of receipt. The above applies unless passengers have purchased Trip Flex. Image courtesy of Allegiant Air. Trip Flex: Allegiant’s Trip Flex is an add-on to the base fare. It costs $8-$20 per person per segment and must be purchased at the time of booking. Trip Flex allows passengers to change their itinerary once or postpone the trip entirely without being charged the $75 change fee that usually applies per segment, per passenger. This can be done up to 1 hour prior to departure. The allowed reservation change includes 1 change to date, flight, or destination; passengers remain responsible for any difference in airfare. While the 1-time change or cancellation is permitted, the ticket remains non-refundable. Since Allegiant starts with an extremely basic base fare, there are a number of excess fees that can be tacked on. This ultimately leads to a higher priced ticket than most consumers expect. However, with base fares starting extremely low at certain airports, these flights can sometimes be worth it even with the additional fees. In terms of luggage, Allegiant’s base fare only includes 1 personal item. This means passengers are charged baggage fees for both carry-on bags and checked bags. Additionally, these prices increase the closer you get to take-off, meaning your best bet is to pre-purchase your allowance during your initial booking. In comparison, Allegiant’s baggage pricing is a bit cheaper than other low-cost competitors like Spirit and WOW air. Baggage fees collected during booking are route-dependent, so the table below displays a general price range. Please visit Allegiant’s page on optional service fees for specific route pricing. Size/Weight Limits: Passengers should note that Allegiant has some extremely tight size/weight limitations for baggage. Unaccompanied Minor: Allegiant does not provide unaccompanied minor services. Passengers under 14 must be accompanied by an adult (15 years or older). Allegiant provides onboard refreshments for an additional cost. Current beverage options at the time of publishing this piece. Image courtesy of allegiantair.com. Current food options at the time of publishing this piece. Image courtesy of allegiantair.com. No one likes to pay additional fees; luckily, they can be easily avoided if you’re utilizing the benefits and offerings of specific credit cards. Allegiant Air cabin and crew. Image courtesy of Allegiant Air. Ever wondered what it’s like onboard an Allegiant flight? We’re breaking down amenities and seat specs so you get a better idea. Inflight Amenities: By now you’re aware that Allegiant is an ultra low-cost airline. This means most inflight amenities are pretty limited compared to traditional airlines. Allegiant does not provide inflight Wi-Fi, video streaming capabilities, or any types of onboard entertainment at this time. Allegiant does not have any electrical outlets onboard for passenger/commercial product use. Seat Specs: All Allegiant planes have only 1 cabin class — economy. Most Allegiant planes have a configuration of about 90% standard seating and 10% with extra leg room. The Boeing 757 has about 70% standard seating and 30% with extra legroom. Additionally, Allegiant seats do not recline. Allegiant claims this saves them weight and therefore cost, again allowing them to pass the savings on to their consumers. This seems to bother some passengers, but others not so much. A view up the aisle. Image courtesy of tripadvisor.com. Hot Tip: If you want to know more about Allegiant’s boarding zones and boarding process, head on over here. What are the most common Allegiant Air complaints? The August 2017 Air Travel Consumer Report filed by Transportation.gov lists 213 complaints against Allegiant during the period between January-June 2017. Below is a breakdown of complaints by number and percentage. As you can see, “Flight Problems” takes the cake, with over 50% of total complaints filed for this reason. We’ve taken a few of the most popular in-depth airline rating and ranking systems and listed where Allegiant falls on each. 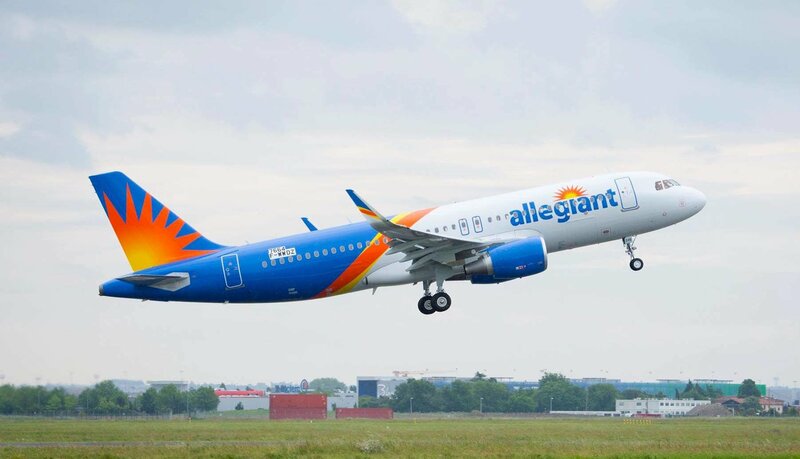 Safety: Allegiant Air has garnered a lot of unwanted attention over the past year, mainly due to concerns surrounding the safety of its flights. In August of 2015, an Allegiant flight aborted take-off at McCarran International airport due to issues related to the nose of the plane lifting off the runway before having enough speed to properly take off. According to reports by the FAA, specific maintenance procedures had not been followed by Allegiant’s maintenance provider (AAR Air Services Inc.), resulting in a missing nut on a specific plane component. This caused the uncontrollable nose rotation related to the aborted takeoff. The FAA investigator found the plane had flown 216 flights in an “unworthy condition.” Further review found an additional 3 planes with the same issue. At that time, the FAA issued a “letter of correction” to AAR, despite the recommendation from the individual investigator that “maximum sanctions” be applied. Since these issues, Allegiant has been closely monitored by the FAA. In May of 2016, the Federal Aviation Administration reported they were conducting an official 90-day review of Allegiant’s operations concerning maintenance and safety. This review (moved up by 2 years) was to investigate 3 main issues: aborted takeoffs, unscheduled landings, and emergency descents. Allegiant reportedly had 37 aborted takeoffs in 2015 alone. Skift stated the FAA considered these issues to be “minor” and “nonsystemic,” and that the agency would not pursue any penalties or enforcement action. Additionally, an analysis of the FAA report by the Tampa Bay Times (November 2016) concluded that Allegiant’s planes were 4 times as likely to fail during flight as those operated by other major U.S. airlines. A report published by Airline Geeks in May 2017 states the airline has continued to experience safety troubles. This includes 2 incidents in March and another incident in April related to its MD-80 series aircraft: a possible internal power plant failure, an engine fire, and suspected elevator control problems. Allegiant’s Response: The same report by Airline Geeks stated that Allegiant has acknowledged their safety issues and is working to lower the numbers. They stated that one of the largest barriers to safety is the average age of the Allegiant fleet (19.8 years). Additionally, the MD-80 series planes that comprise 51% of the fleet had an average age of 27.5 years. AG claims Allegiant saves money and keeps costs lower by purchasing used aircraft that sometimes sell for less than half of what a new aircraft costs. However, in attempts to decrease safety concerns and comply with FAA recommendations, Allegiant is in the process of transitioning to an all Airbus fleet. The airline hopes this exchange will mitigate concerns and result in an improved safety performance record. Performance: Allegiant Air will begin reporting data for the Department of Transportation’s Air Travel & Consumer Report in 2018. Without official reports, we can still get a general picture of performance based on the customer reviews above. Due to the slew of recent mechanical issues, customers have made increasingly negative complaints regarding the airline’s delays and cancellations. Remember, “Flight Problems” (including delays, cancellations, and misconnections) account for over 50% of customer complaints related to Allegiant’s performance. Allegiant Air teams up with the Make-A-Wish Foundation. Image courtesy of Allegiant Air. Yes, when compared to other U.S.-based airlines, Allegiant Air appears to be sub-par in customer satisfaction and performance/safety. However where they really step it up is through their charity partnership with the Make-A-Wish Foundation. Today marks the 5-year anniversary of Allegiant’s partnership with Make-A-Wish. First joining together to grant a little boy’s wish to visit theme parks in Orlando, FL, the partnership has now flown over 900 children to their wish destinations. Allegiant gives ~$1 million annually to Make-A-Wish and also donates $1 from every Wingz Kid Snack Pack sold inflight. Allegiant’s donation of a 7,000-square-foot office space known as “The Wishing Place.” Image courtesy of snv.wish.org. In March of this year, Allegiant also donated a 7,000-square-foot office space on their campus in Summerlin, NV to Make-A-Wish of Southern Nevada. The “Get Away, Your Way” campaign. Image courtesy of allegiantair.com. If you’ve ever thought, “Why is Allegiant so cheap?”…now you know. Allegiant is an ultra low-cost airline that drives down prices by charging customers a base fare, then adding on extras based on each customer’s preference. Most notably, this includes fees for carry-ons, checked bags, seat selection, and inflight refreshments (albeit at lower costs than its competitors). If you have the right credit card in your wallet, you can easily cover the cost of these added fees with a travel credit. Allegiant’s prices sit lower due to the airline’s older fleet. However, this fleet comes with some serious safety concerns (especially in their MD-80 series), which Allegiant is attempting to address by bringing newer Airbus planes into the mix. So if you’re looking for a cheap fare, have some flexibility to fly on random days of the week, and you don’t mind a stripped down flight experience, it may be worth giving Allegiant a shot. On the other hand, with a recent slew of safety concerns over the past 2 years, it might be worth checking what type of plane your route is scheduled on before booking that ticket. Hi Adam, thanks for your input! JetBlue and Allegiant are definitely solid, budget-conscious choices!